The Air-Dock boat lift was conceived over a decade ago. Since its introduction in 1999, thousands have been sold and are currently in use in countries all around the world. The idea was conceived and initially tested near Indianapolis, Indiana on one of this countries’ filthiest and most polluted reservoirs. In fact, you could expect a bathtub ring on your hull after mooring for about an hour. With the absence of boat lifts at the local marina, a floating raft, such as an inflatable boat, under the boat and capable of carrying the weight and hoisting the boat just a few inches above the water was envisioned. The belief was that if it could work there and keep the boat hull clean, it could work anywhere. Simple studies with models and engineering calculations proved that most pleasure boats could easily be raised with very low air pressures, in fact, the kind of pressure supplied by a simple household vacuum cleaner. Further testing determined that these vacuum cleaner blowers could be operated with power from the boat's own battery converted to standard 110 volt AC with a battery inverter without noticeable drain on the battery. After extensive research, a material was selected that exceeded the strength, longevity, and durability requirements to raise boats and keep their hulls clean. The Air-Dock material is very tough, long lasting, and resistant to most chemicals, UV rays, and other environmental factors. In late 2004, Air-Dock relocated to Saint Petersburg, Florida. Today, there are thousands of Air-Dock boat lifts in use around the world protecting personal water crafts, jet skis, V-hulls, tri-hulls, deck boats, catamarans, pontoons, tritoons, retractable keel sailboats, trimarans, high performance boats, deck boats, and even seaplanes. These lifts are operated in deep water, shallow water, fresh water, brackish, and salt water. 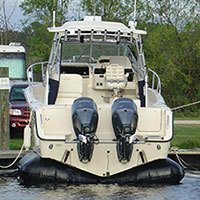 Air-Dock boat lifts are used at private docks and commercial and municipal marinas, as well as at condominiums. In fact, their unobtrusive appearance has led to our boat lifts being approved at many condominiums that don't allow other lifts. 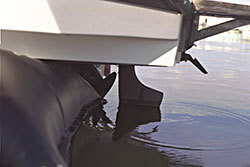 We appreciate you considering an Air-Dock boat lift for your application. If all of your questions are not answered by this web site just give us a call and we will be happy to answer them. We appreciate your feedback regarding this website as well.